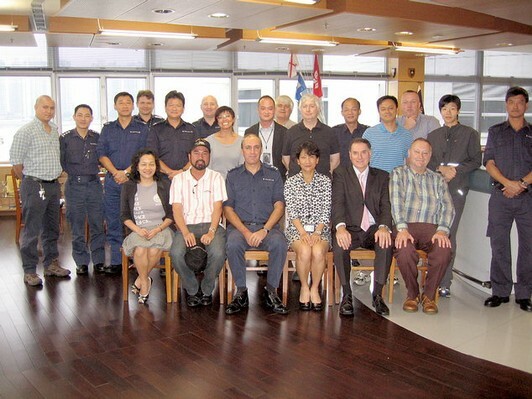 To welcome our good friend and previous vice Chairman, Mr. Trevor Hollingsbee, The Hong Kong Branch committee of the Nautical Institute organized a curry lunch at the Marine Police Sha Tin Headquarter on 26 May 2009. We had the best curry we ever had since a long while at the Marine Police Headquarter, with a wonderful and heartwarming welcome from all the Commanders of different districts from Marine Police. With the best hospitality from the Commander, Mr. Roderick Colson, we had the most elegant limousine Police car to pick us up from the railway station. 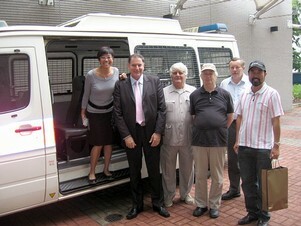 It was probably the first experience for all of our members to have a ride in one of the Police car, which was the normal transportation for criminals being arrest (without hand cuffs). Among the many friends we had made, we had a tragic episode, Eric Edmondson, our senior committee member, and the coordinator of this curry lunch was supposed to meet us at the University Station at 1145hrs, had a minor stroke which caused him a minor injury from a fall at home the night before the visiting. According to Eric’s wife, he had hurt himself by falling and had to stay at the Kong Wah Hospital for about three to four days for better recovery. The officers’ bar at the Sha Tin Marine Police Headquarter was very nice and traditional. It was easy to find many items that we might be able to find on board, such as a very well polished telegraph, ship’s lanterns, a compass and, even a traditional wooden steering wheel next to the bar. Of course, we found a commander chair at the bar end where you can have aring on the ships’ bell. 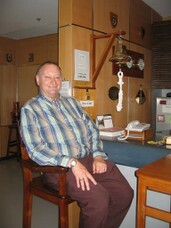 Trevor enjoyed sitting at the chair and rang the bell to retrieve good memories. From time to time, we saw a few Marine Police patrol boats coming from the middle of nowhere in high speed, which, to us, was really astonishing. 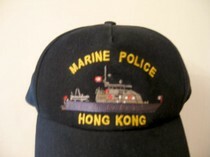 In order to express our gratitude, We offered some NIHK caps to them as souvenirs before we left, in return we had one of their very smart cap from the Marine Police for memory. 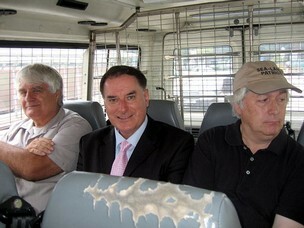 Everybody was so enjoyed to have a wonderful curry lunch with all those commanders of Hong Kong waters. On behalf of the Nautical Institute Hong Kong Branch, we thank Commander Roderick Colson, Commander Mark Taylor, Commander Frederick Siu, Mr. James Mather and all other superintendents, Inspectors and officers for their hospitality. The Hong Kong Marine Police are most welcomed to join our presentation and every events in future. At last, We are all sharing our best wishes to Eric for a quick and good recovery! We are Looking forwards to seeing him and all of you in the AGM at the Police Officers’ Club at 1800hrs on 11 June 2009.